There are many properties available for sale and for rent in Singapore recently, such as property in Geylang. If you have just recently gotten a new house yourself and you are planning to renovate your house, this article is for you! I will be writing about some general guidelines for renovating your 'home sweet home'. You are renovating your home? So what ? Just call the contractor to renovate.... mmmmm...isn't that impulsive? You need some planning works to do that. * Engage an ID (Interior Designer) ? At least you less headache. Just leave the the entire process to complete it all the way for you. Start from designing to the move in day. Leave it to the 'pro'. This will cost you more money. * Self manage by engaging with contractors and various service providers. I won't say this will not cost you more money or less money. If you don't manage it properly , this could be a huge disaster. Well, if you are opting to self manage the entire process or renovating your home , then read further. Here are guidelines for you to follow when it comes to renovating your home. Why you need an excel sheet? This is to simplify your process to keep it smooth , easy and easier for your overall comparison of ideas and costing. Important note : Please set a realistic budget for your renovation to make sure its within your budget or getting a huge renovation loan. Make sure you don't end up regret when it come to payment time or it will be too late to even turn back time. Nowadays, the technology make us convenient to browse for information. Just search around for some inspiration or idea. Sites like Pinterest or Qanvast will show you different ideas from paint color or bedroom designs and up to even types of lighting and furniture used. After you done with your search and identified the style and design suits your preference for living room, kitchen, bathrooms and bedrooms, you can then make and appointment and start to discuss with your service providers to achieve your ideas. Always bear in mind , you might not achieve 100% as what you see in photo but you may get your contractor to works towards the closest. There are many contractors available in Singapore, so make sure you do some research before you engage one. Make sure engage the one you feel most confident with in their workmanship. If you plan to restructure your house, make sure you double check with your contractor on whether any demolition or hacking work is allowed in your premises. An experienced contractor will then be able to give you some advice on what can be done and what cannot be done. Cost of hacking could go from $400 to $1,000, depending on the size. Any shirting in electrical points, pipes and air conditioner trunking should be done as early as you can before the massive renovation work starts. Air conditioner trunking should be done earlier and the air conditioner units can be installed much later. Furthermore, you will also need to decide on whether do use a storage tank heater, electric heater or gas heater when it comes to water heater at home. There are a few areas in your house that you might wish to build kerbs at, such as the main entrance door, toilet area and the kitchen entrance door. If you wish to have a change in the floor tiles, the cost of it would go from $6,000 onwards, depending on the material and size of your home. I personally love laminated flooring. Choosing the right paint, the right color makes a huge difference. Using the right paint can instantaneously revive and brighten your initially dull looking unit. Some people prefer all white. Hence, choose a color that will brighten up your unit or a color that adds a touch of liveliness for your unit. Nobody wants to come back to a place where it further brings down the already-tired-from-work mood. Make sure to use only good quality paint as well to protect your home and will certainly last you a few years. If you are unsure of which color to choose, you can always ask for advice from the stores, as most stores offer a wide variety of colors for you to choose from and they will be able to advise you on the matching of the color that suits your house theme. You could also opt for having wallpapers it is a cheaper option to nice and creative painting. Moreover, it is easily changeable if your tastes ever change in the future. You could install false ceiling to your home to beautify the place. You could choose to install false ceiling at your living area, foyer area and the bedrooms. Different ceiling work such as lighting holders or L Box could give a different classy effect to your home. This work well for those who love to install chandelier to make home look more grand. You could do some carpentry work on your kitchen cabinets, TV consoles, false ceilings, doors, feature walls, wardrobes, bed frames and the tables at home. Do your research and look for a carpenter with good workmanship. If you are using the same design and material for your whole house, you could try to negotiate for a better price with your carpenter as the material will be cheaper when it is ordered in large quantity. Up to here...do you feel this is so much work to do? Well...you are almost there to own a fabulous dream home. You are now one step closer to moving in to your dream house. After the renovation is done, it is time to clean up the mess left behind. You will need to engage with some cleaning service and disposal service to dispose all the renovation debris, and do clean up your house, including a chemical wash. I would rather hire the cleaning service people to do it for me rather than breaking my arm and waist to do this myself. Its not an easy job you know! Finally, you can move in your furniture and electronics items. This is normally the last step as it is to prevent any unnecessary damage to your precious furniture and electronics during the renovation period. In conclusion, renovating your home on your own is not too difficult of a job, as long as you monitor closely to the work done by different service provider. Most importantly, they are definitely affordable as compared to engaging an interior design that would break your bank account. Additional reminder, make sure you have the time to manage it all too. Renovating a homes is always costly but at the end of the day, there's nothing more rewarding than watching a space be transformed by good design decisions and great workmanship. Banyak aspek yang perlu kita ambil tahu sebelum nak renovate atau masuk rumah baru . Kalau ada bajet, Ros pun akan ambil pereka hiasan dalaman untuk ubahsuai susun atur rumah. Teringin juga nak rumah yang cantik ikut citarasa sendiri.. Such a good guidelines in renovating our homes. 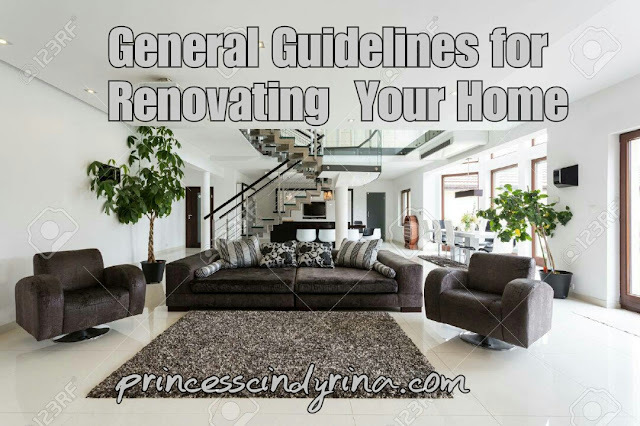 Sometimes we want to renovate our house, but we dont know where to start, but with this guidelines, it really help us in making smooth all the steps for renovating. First we need to specify our budget first & what concept we want to renovate our house. House after renovation will give a new mood. Nice tips. This is a good guideline as I planning to renovate my new house. Still thinking which part to do first. I have 1 important tip, make sure that you like it. If you dont like it, then why bother renovate right. Thanks for your sharing, tips and infor. I am planning to renovate my store room and maybe extend my kitchen this will be helpful to me.